This is the first time I review a book or write a post about a book and I don't really know if you'll like it or not but I'd like to talk more about books because I love reading them and since my mum works in a public library, I read quite a few. I have to say that this book probably changed my life. It's the first time I've read something like this. I had never read a biography, a memoir, a factual book unless it was for school. This was the first book of this kind that I read in my spare time and I loved it. 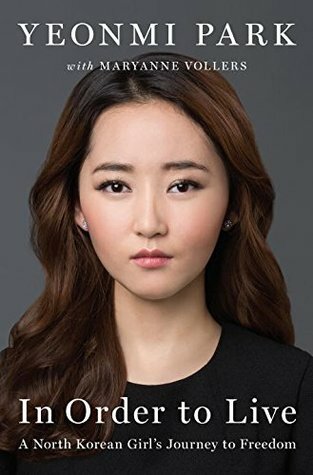 This book was written by a North Korean activist named Yeonmi Park and it tells the story of how her life was like while still in North Korea, how she escaped North Korea and all the struggles she had to go through afterward. And it's amazing how someone so young has been through so much and still has the strength to fight for others who are going through the same things that she went through. I'm not gonna talk too much about the content of the book because I really want you to read it for yourself. When I first started reading the book I had no idea what North Korea was like. I had no expectations for the book and I didn't know what I was getting myself into. And oh boy it was quite a journey. I'm not an emotional person, at all, but while reading this book there were times when I wanted to cry my eyes out, in anger, sadness or a mix of both. It really opened my eyes to what's happening on the other side of the world. I definitely recommend this to everyone reading this post, no matter what your age, gender or favourite book genre is. And I especially recommend it to anyone under the age of 20 because we're the generation that is slowly changing the world and this book will only motivate us to keep fighting. I saw a video of her speaking and it was very moving! I didn't know there was a book. I will have to put this on my reading list! The book is absolutely amazing, you need to check it out! Thank you so much for stopping by Laura!